Get the gossip on one of Vegas' biggest parties At Madame Tussauds Las Vegas! Partied with Bradley Cooper in a swanky penthouse? Check. Practiced my DJ skills with Steve Aoki? Uhm, YES! Hopped on stage with Queen Bey? Totally. Celebrated VIP style with Justin Bieber at one of Vegas' hottest nightclubs? Definitely! And guess what? You can too ( seriously!) How? Easy. Madame Tussauds Las Vegas at The Venetian on the Las Vegas Strip! No trip to Venice or The Venetian would be complete without a smooth and romantic glide down the outdoor Grand Canal in an authentic Venetian gondola. 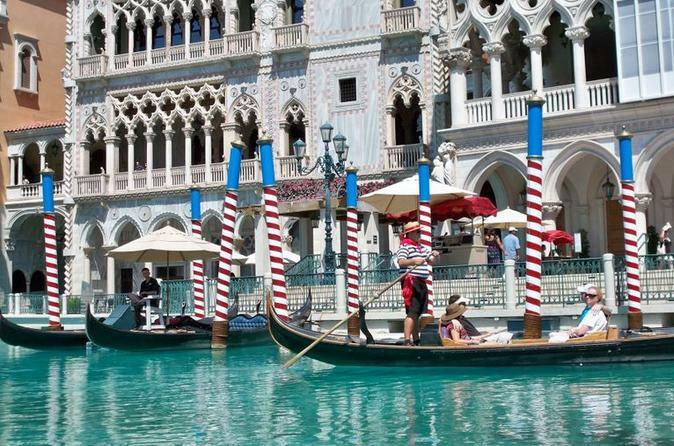 Float beneath bridges as your gondolier sweeps you down the outdoor Grand Canal for a ride like no other. Please note that this is a shared ride. An extra fee can be paid direct to have a private ride. Special Offer - Book and save between 16% and 25% compared to the local supplier's prices for the Duo or Trio Packages! - Book Now!